In 2014, members of Team Echinacea did an experiment to test methods of removing Hawkweed. Last year Ali assessed the results of the different methods that they used: cutting the head and painting the stem with herbicide, painting the leaves with herbicide, hand pulling with and without tools, and a control treatment. You can read her post describing the experiment and with the results from 2015 update here and the original post with methods here. I went back to the treatment plots this morning and assessed Hawkweed percent cover two years after the treatment. 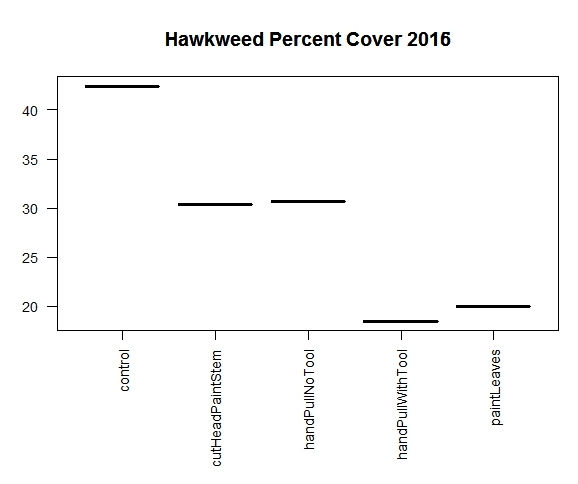 The plots with the lowest percent cover this year were those where they removed hawkweed by hand, with tools. These plots also had the smallest percent change from 2015 to 2016, indicating lasting effects of removal. This was in contrast to those that had been treated by painting leaves with herbicide, where plots had an average of 4x increase in Hawkweed. 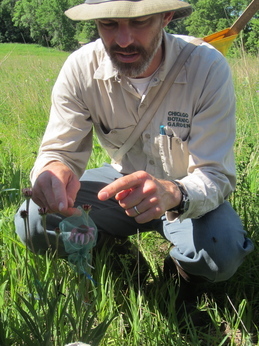 From now on, we’ll use this method to remove Hawkweed in P1. We’ll assess percent cover in the treatment plots and the status of other Hawkweed plants in p1 to keep track of our progress at eradicating Hawkweed from the common garden. Must destroy all sweet clover! The gang had a busy day today, almost all of it in the warm June sun. Alyson continued setting up her experimental plots in the Staffanson bog, and spent the afternoon measuring canopy cover and soil pH for her IS project. Meanwhile, the rest of the team (minus Gretel, who was setting up work for q2 juvenile counts) picked up our fleg begs and counted Hesperostipa spartea and weeded in p1. Amy and James found one H. spartea specimen with 137 seeds! We are now up to 17 out of 59 rows surveyed. Meanwhile, Will, Alex and Per led the crew in weeding out the non-native yellow sweet clover (Melilotus) from the periphery of the plot area. Hopefully we eliminated a lot of potential seeds form the seed bank, meaning that in future years the rows will be devoid of this weedy legume and the study Echinacea will have less competition. Stuart also showed me what poison ivy looks like for the third time, and I still don’t think I could pick it out of a lineup. 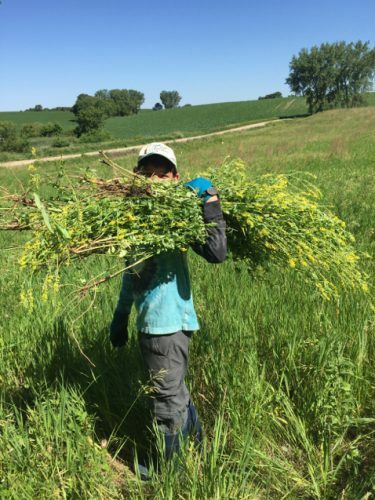 Per with a bundle of sweet clover picked from around p1. This is probably less than 10% of what was removed today. 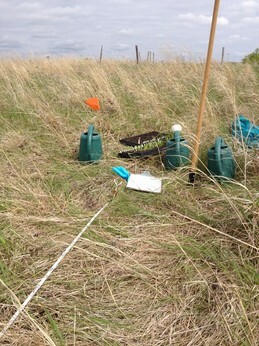 After some brief (or for Alex, who was cleaning the bathroom, not so brief) chores at the Hjelm House, the team returned to exPt8 (experimental plot 8) to search for juvenile Echinacea crosses planted in 2013. This meant more time bent over, although now instead of looking for seedlings we were looking for melted bits of toothpick (which were placed to mark seedlings). Some seedlings were in great shape — Alex and I found a couple with basal leaves over 10 cm tall. Others were not in great shape, either dead or missing like Jimmy Hoffa. We got about a third of the work for qGen2 this afternoon. It may rain tomorrow, so we’re bracing for indoors-work and hiding our bicycles inside. 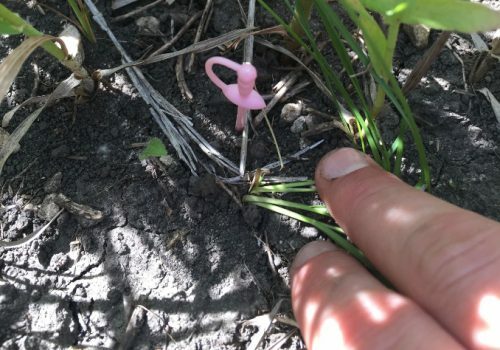 Using a pink sword to claim the new seedling (left) for Team Echinacea. We used cocktail swords to denote seedlings germinating this year from achenes sown in 2013. Today we started in P8 by pulling some sweet clover. It was not a task to be taken lightly, only the heartiest could master the “full pull.” It was really in the ground and being held tight by Brome grass. We did manage to pull on and get a lot pulled out and removed. Hopefully there will be a lot less in the plot from now on. Below is a picture of our bundles. We figured they were at least as big or bigger than Gina! We broke for lunch and then started flagging in P1 and at Hegg lake. We were all getting quite good at finding plants and/or staples and almost had all the 5 meter flagging done when a sudden, unexpected rain shower left us running for cover! 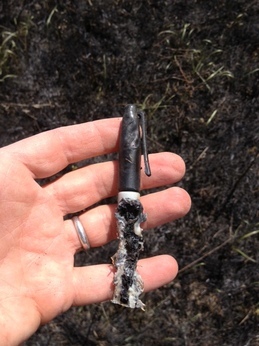 Visited Hegg Lake WMA during burn, fire looks great! SW broadcast Bouteloua, Schizachyrium, and Galium in P2 at Hegg. All seed was collected from Hegg WMA in fall 2014. 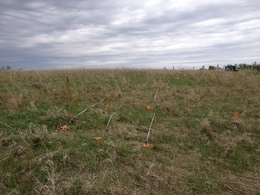 These are the methods for the hawkweed removal experiment performed by Allison Grecco, Cam Shorb, Jared Beck and Elizabeth Mays in experimental plot 1. The percent basal cover of hawkweed in each quadrant is to be determined by Team Echinacea in Summer 2015. We are preparing to plant a new experiment this fall. We are cutting down ash trees (Fraxinus pennsylvanicus) in an abandoned agricultural field that was planted with Brome in the 1980s. We will plant Echinacea angustifolia seeds from our experimental crosses this summer. We will hand broadcast two native warm-season grasses: Bouteloua curtipendula (sideoats grama) and Schizachyrium scoparium (little bluestem). Keep up-to-date on progress on this experiment via twitter. 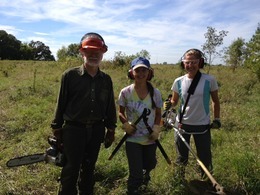 Dwight, Lydia, & Ilse with tools of the day: chainsaw, loppers, brushcutter. Not shown: paintbrush. I drove from the Chicago Botanic Garden to our field site in western Minnesota hoping for a window of appropriate burning weather on Thursday afternoon or Friday afternoon. I also brought 297 Echinacea seedlings to plant as part of an experiment that investigates hybridization between native and non-native Echinacea. 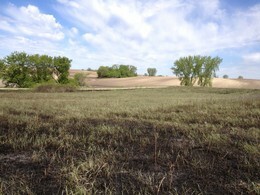 Several gallons of side-oats grama grass seed were waiting to be hand broadcast at two sites after the burn. We want to burn our large Echinacea “common garden experiment.” In this abandoned field we have planted about 14000 individual Echinacea plants, starting in 1996, and measured their growth and flowering every year. 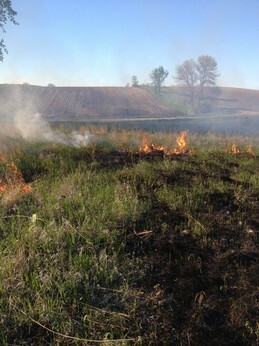 We have burned this ~6 acre plot every other spring from 1998 to 2008. The weather didn’t cooperate in 2010, so we burned in 2011. We are trying to burn this year! 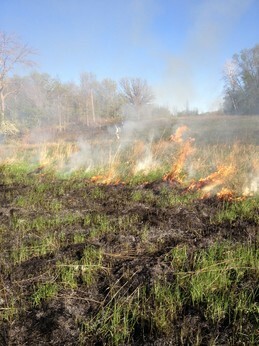 Burning in the spring really increases the chance that an Echinacea plant will flower. 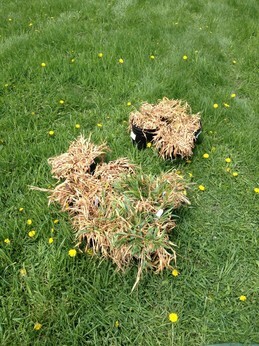 We are planning a big crossing experiment this summer, so we want as many plants to flower as possible. 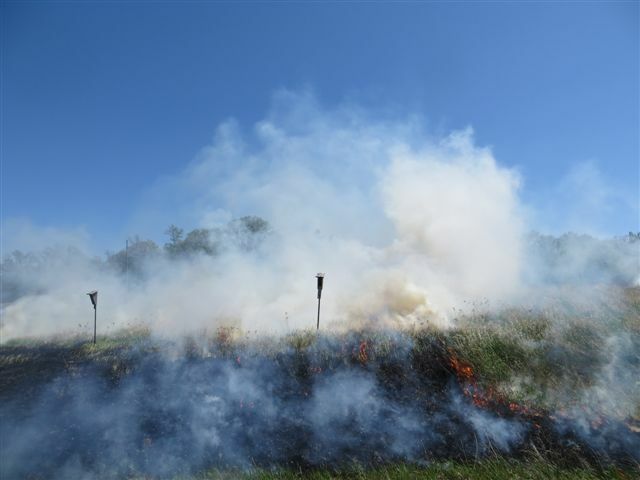 Also, burning sets back the weeds–and that is a good thing. Here’s the quick recap of major activities. I loaded the truck with lots of field equipment to use during the summer. The seedlings in the hybridization experiment fit in three trays. I had two trays of “extra” seedlings that were still hanging on from Jill’s agar/blotter seed germination experiment. 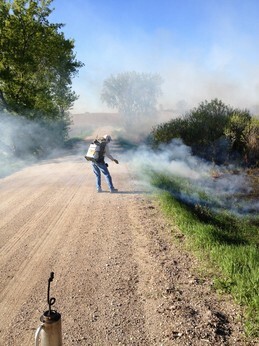 For the burn, I brought three backpack sprayers, the DNR burn permit, and batteries for radios. I forgot to bring a back-up drip torch. The drive to Minneapolis was generally uneventful, which is just what one wants when driving an 18-year old truck. Very early on Thursday I drove to the site. Shortly before arriving, I saw two Sandhill Cranes landing in a wet field near Holmes City. I think that’s the first time I’ve seen cranes on the ground in Douglas County–auspicious! I should mention that I also saw a Common Loon and Pelicans, which are common every summer in Douglas County. Seeing them makes for an auspicious day too. Thursday morning the ground was wet and the wet grass duff (fuel) didn’t look very promising for burning. 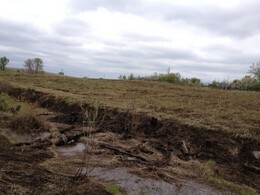 The erosion in the surrounding corn fields indicated it had rained a lot. Our rain gauge confirmed that showing 3.65 inches (93 mm) of precipitation in the previous week. Light winds and cool temps weren’t helping dry it out, but the sun and low humidity offered a glimmer of hope. It’s rather stressful trying to predict burn weather and decide whether to rally folks to make a long trip to help burn. Dwight and I began preparations for the burn. Just after noon, it looked like the fuel might dry out enough to burn and the weather forecast looked great, so I let folks know that we were going to attempt to burn in late afternoon. I should add that the fire forecast for Friday was getting worse, so that a burn was going to happen on Thursday or never (well, June or 2014). Amy, Brad, Dwight, Jean, and I conducted the burn and it went smoothly. Amy made a nice post with photos. The burn was slow and thorough. Ignition initiated at 5:20 and we were done at 8:20. Winds were light ESE ~ 8 mph. We had a great dinner afterward. On Friday I hand broadcast about 2 gallons (8 liters) of native grass seed. 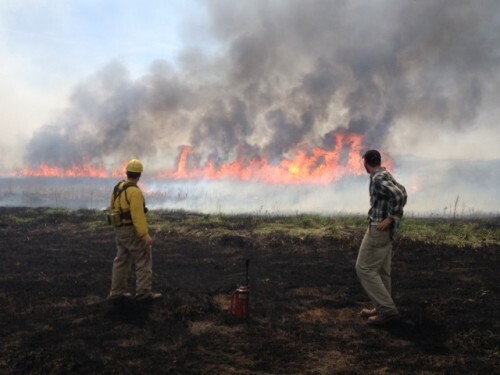 More warm season grasses will provide fuel for future fires! The Soras chattering in the neighboring wetland kept me company. Here’s the seed sources–keeping it local! Next job was getting those seedlings in the ground! The forecast was for lots of rain during the upcoming week, which is great for seedlings, and for lots of rain in the afternoon, which is not so great for a person planting seedlings. I had to hurry. I was quite efficient, except that I paused to watch a pair of Trumpeter Swans at Hegg Lake WMA–another first for me in Douglas County. I got a very nice look at the birds up close and saw the shape and color of their bills–straight and all black. I didn’t hear them, so I’m not 100% positive they were trumpeters. Tundra swans apparently look similar, but I haven’t seen them up close for years. 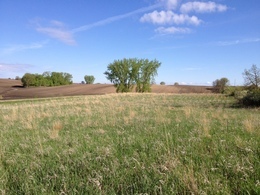 I chose a uniform location in an area that was planted with warm season grasses in 2000 for this experimental plot. I was considering mowing the area, or at least the rows to facilitate making straight rows and putting the plugs in, but I decided against it. I laid out 300 planting locations (10 m x 30 m) with meter tapes and pin flags. A 9m x 29m grid would be sufficient for 300 locations, but I don’t like to plant at 0m on a tape and I planned to leave a few flags at locations with no plants. These seedlings all originate from plants that flowered at Hegg Lake last summer. Shona conducted the summer experiment and prepared the seeds for germination. Read about Shona’s project. Jill germinated the seeds this spring and measured the seedlings multiple times. Read about Jill’s project. I ended up planting one tray (~100 seedlings) on Friday before getting rained out. Planting in the light rain worked for a while, but it was slow. When it really started coming down, I bagged it. On Saturday morning I saw the pair of Trumpeters at the flooded field SW of MN27 & CR1. The nearby Canada Geese were much smaller. A black tern flew overhead. When I arrived at Hegg, I saw fresh truck tracks and what looked like a can of beer and a pair of underwear right in the middle of the parking area. They were not there the day before! Upon closer inspection I realized that it was a can of Nos energy drink, not beer. Saturday proved to be cold but not too cold. It was 54 degrees F and very windy. I wore nitrile gloves and that kept my hands warm. I planted almost twice as fast as I did when it was raining. The Bobolinks kept me entertained all morning with their bubbling songs. Right after finishing planting I went to the phenology plot and broadcast some native seeds that we collected last fall. I broadcast the seed fast and it dispersed well in the strong and gusty wind. There is a new fox den with a big pile of dirt in the middle of the plot. The only plants I saw flowering were Sambucus, Dandelion, and Antennaria. I’m sure others have been flowering, but it was overcast and cold and I was moving fast. As I left Hegg Lake a wild Turkey walked out in the road in front of my truck. So nice to see. 1. Bouteloua curtipendula from Hegg Lake WMA 13 Aug 2012 (#4 bag). 2. Bouteloua curtipendula from NE corner of Hegg Lake WMA 27 Aug 2012 (grocery bag). 3. Schizachyrium scoparium (& some Bouteloua curtipendula) from along CR 15 at Hegg Lake WMA 16 Sept 2012 (grocery bag). I left around 5:45 AM on Sunday. As I climbed in the truck I heard a Great-crested flycatcher–first of the season–so, I suspected it would be an auspicious trip. It was a boring drive, just the way I like it. I talked to myself about mating isolation and asynchrony to help prepare for writing a proposal to NSF on this topic. Postscript. I didn’t have time to plant a few of Maria’s left-over Dichanthelium plants. Jean said she would be glad to plant them in her prairie garden. Maria’s Dichanthelium plants. Some have been exposed to cold temperatures for the past month or so. 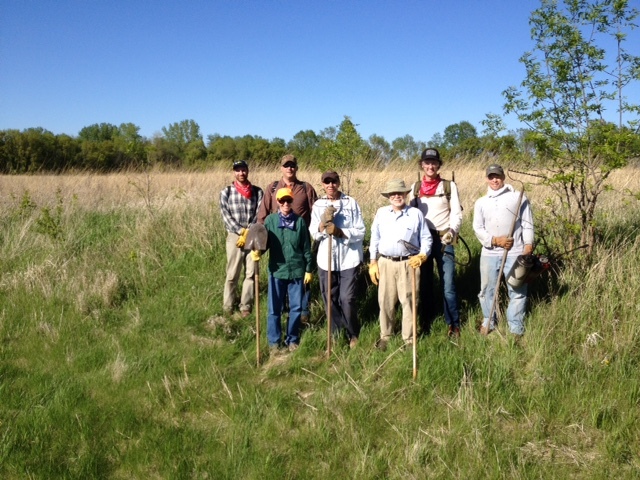 Last week was a busy and fun one for Team Echinacea 2012; no two days were the same. We wrapped up some of the first summer projects and started to transition into the second phase of the summer. 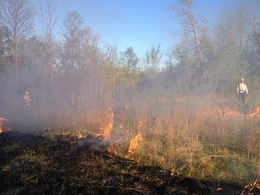 We completed evaluating the recruitment plots, began to record their GPS locations, conducted demography and phenology observations in the common garden, and perhaps most notably, completed round one of seeding searches with the west (and recently burned) section of Staffanson prairie with help from Amy Dykstra, who came to visit on Friday. In addition to all the progress made on the long-term projects, we also spent multiple rainy mornings working on our individual research projects, the proposals for which have been recently, or will soon be posted here on the flog. Stuart Instructs us on the proper field techniques for cross-pollination, pollinator exclusion, and painting flowers so we can keep track of what we’ve just done. After a short weekend, we started up working again this Monday with a morning dedicated to our independent projects, time which we all used to get out in the field and get our hands dirty. Ruth stopped by today and lent a hand and some very welcome advise, and joined the crew in the afternoon to do some weeding in the common garden. 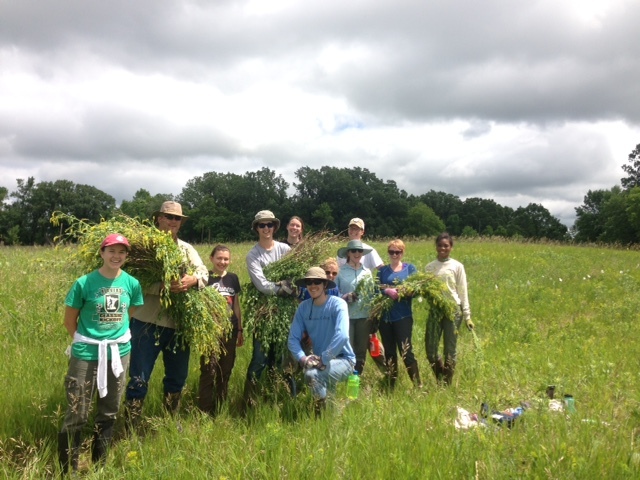 We clipped, pulled, and trimmed Buckthorn, Ash saplings, Birdsfoot Trefoil, Sweet Clover, and Sumac.